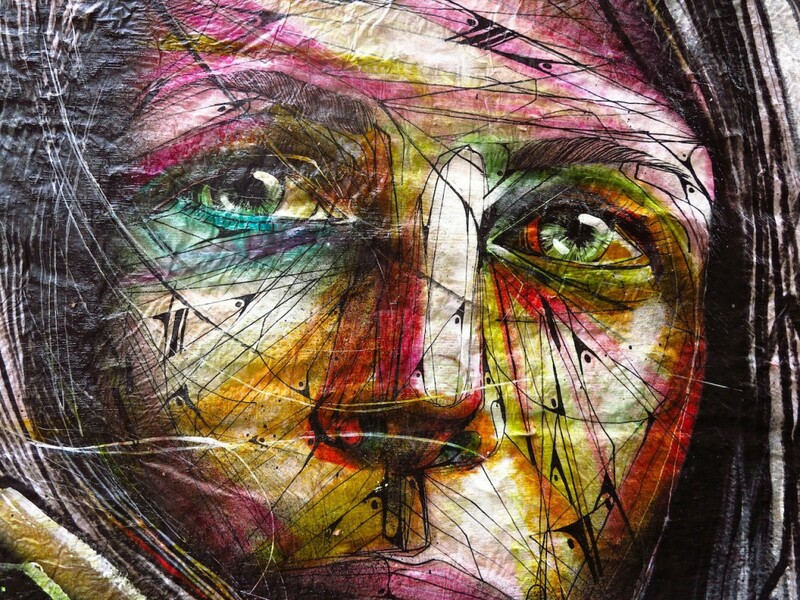 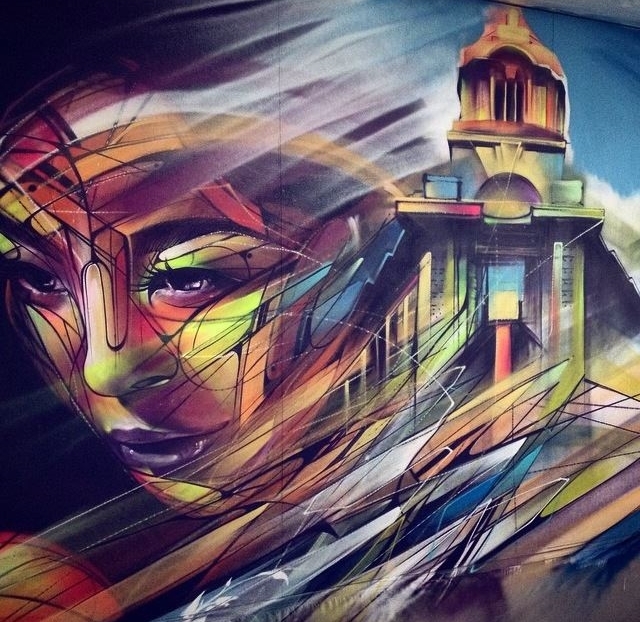 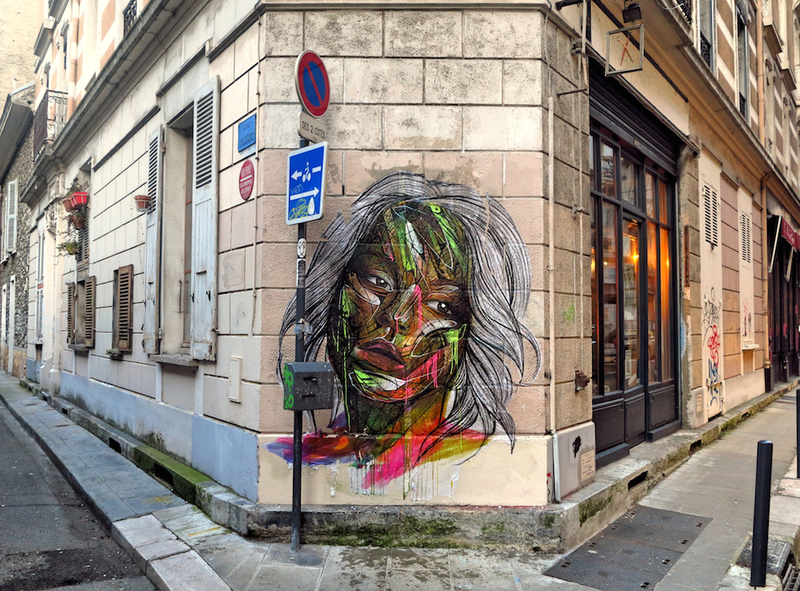 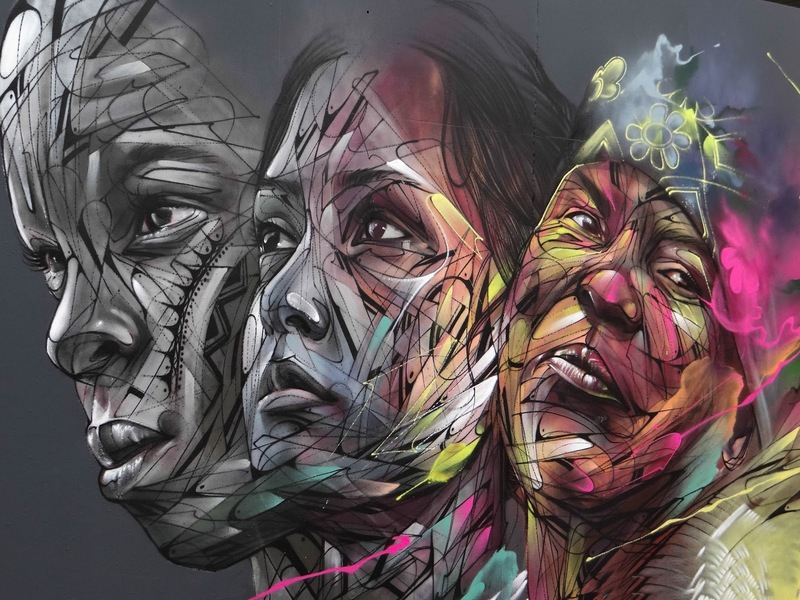 Alexandre Monteiro aka Hopare is a Paris-based growing figure of the street art scene. 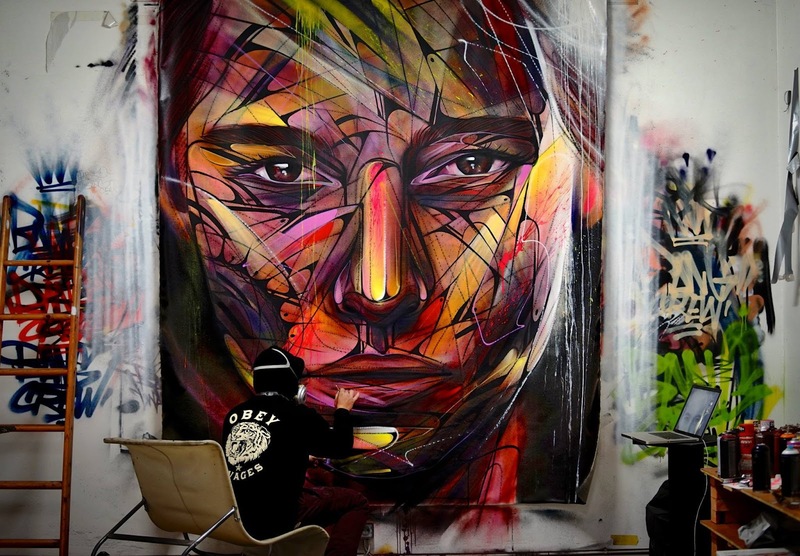 He discovered street art when he was around 12 years old while coming across an old factory covered with graffiti. 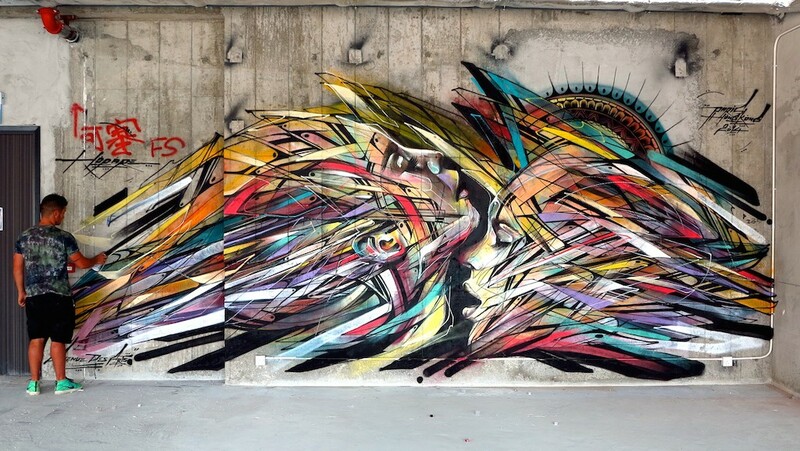 He then started his very first illegal graffiti. 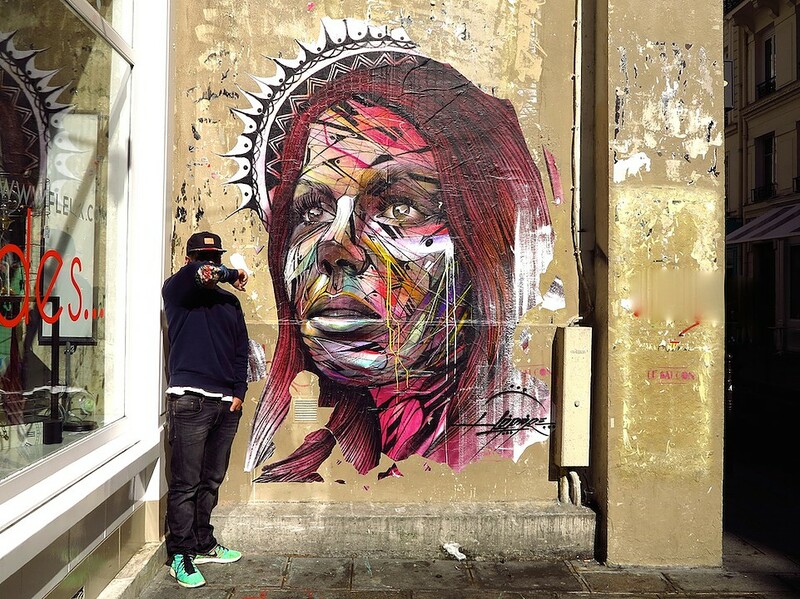 In 2005 when he was in junior high school he was tremendously influenced by his art teacher who was none other than Shaka, a well-known French street artist still in the game. 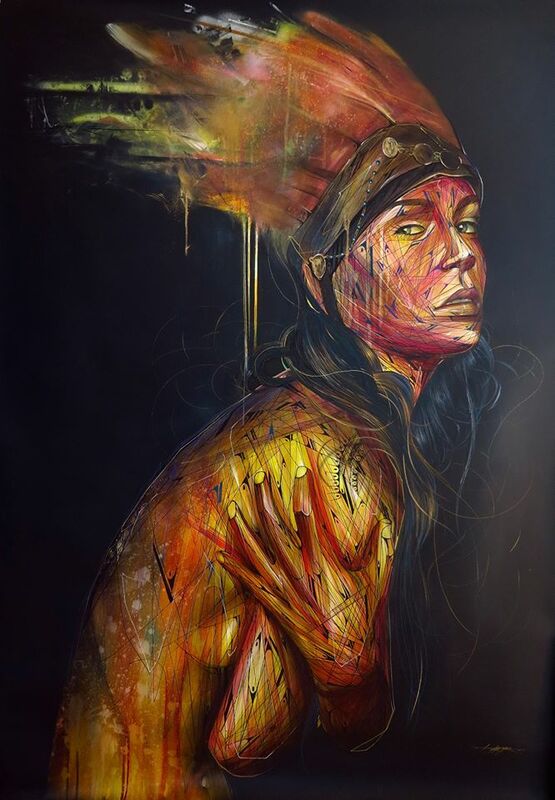 The pupil and the teacher shared lots of artistic times together, so many that young Hopare prefered to skip the recess to draw with Shaka. 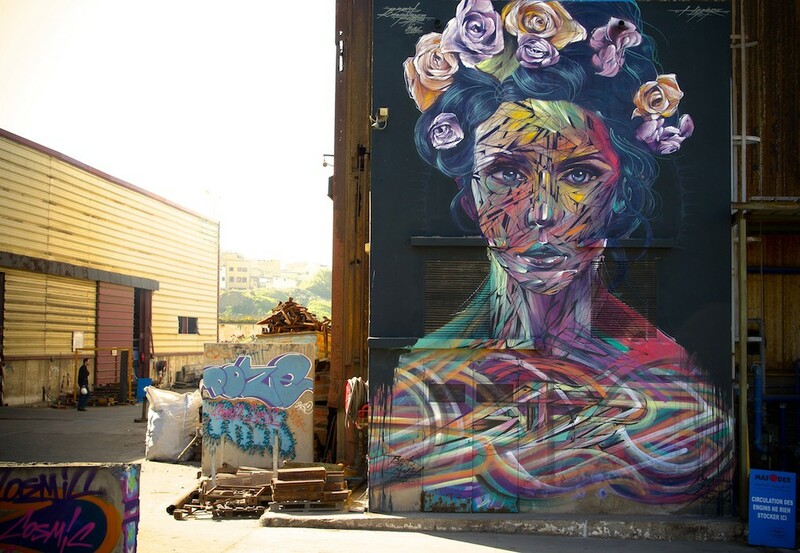 A year later Hopare painted his first important mural and soon after integrated TSF Crew. 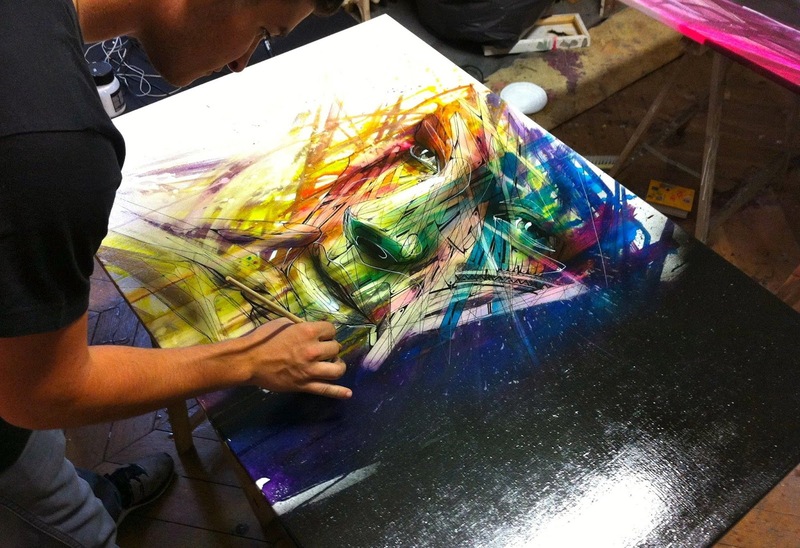 At that time his style was somehow fragile and the young boy was still in pursuit of his own artistic identity. 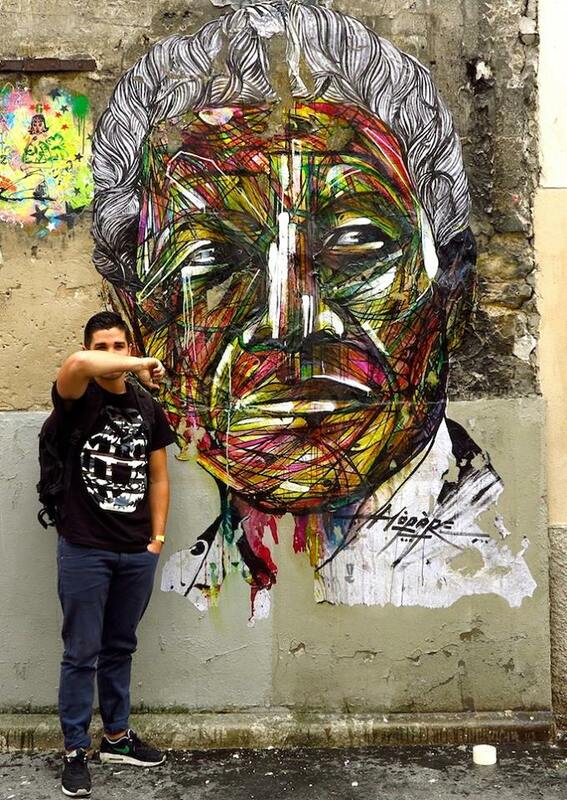 During twelfth grade, Monteiro worked for an interior architecture company. 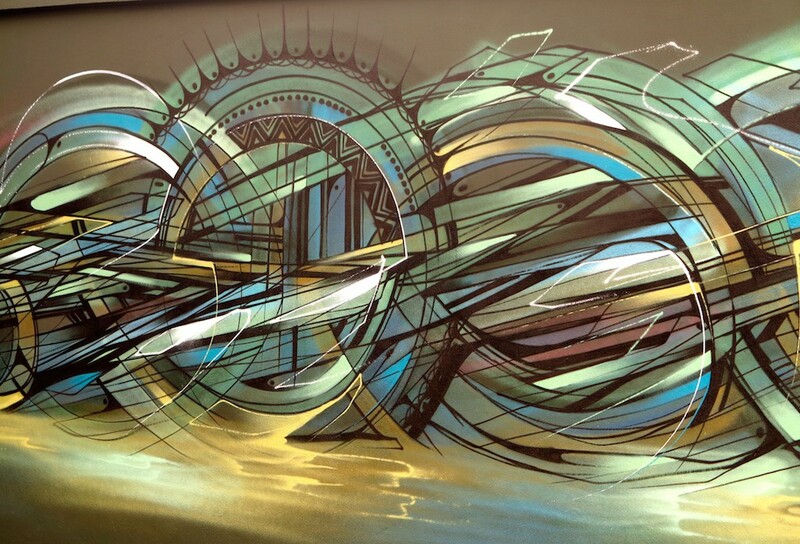 This job influenced a lot his way of drawing, which included more and more straight lines then. 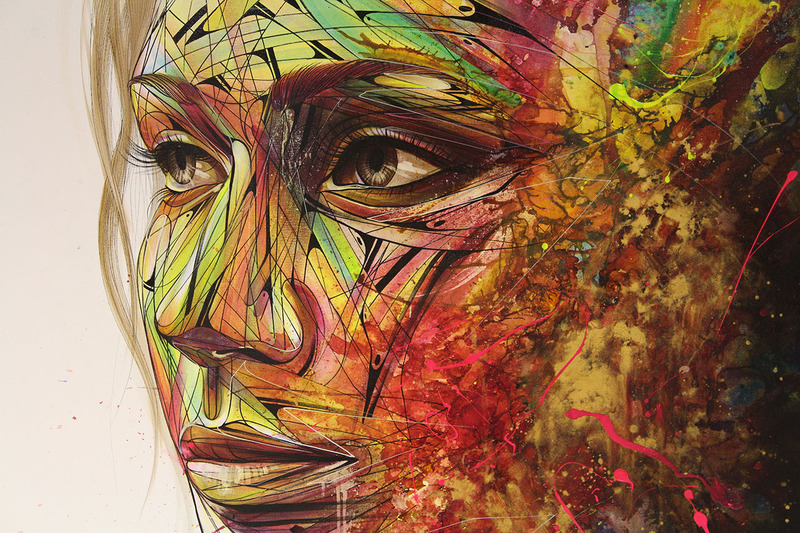 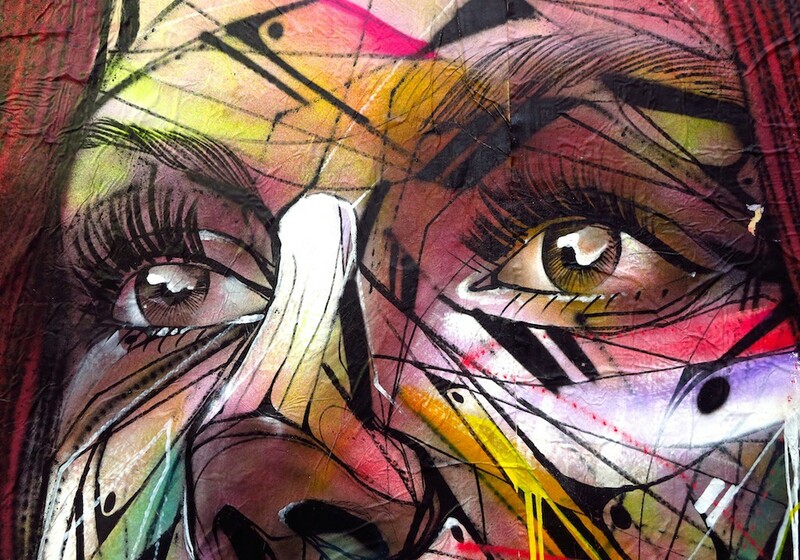 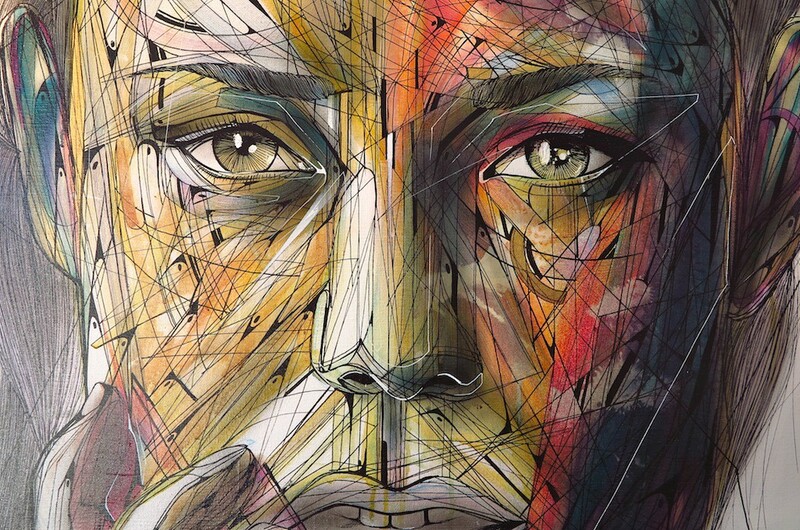 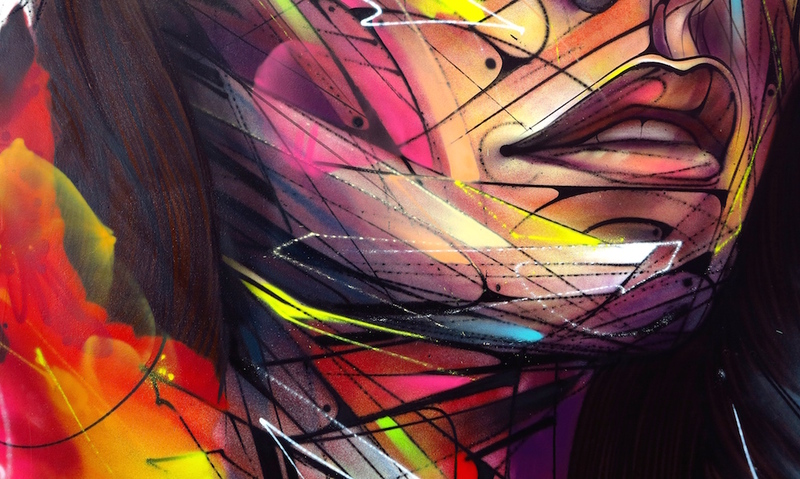 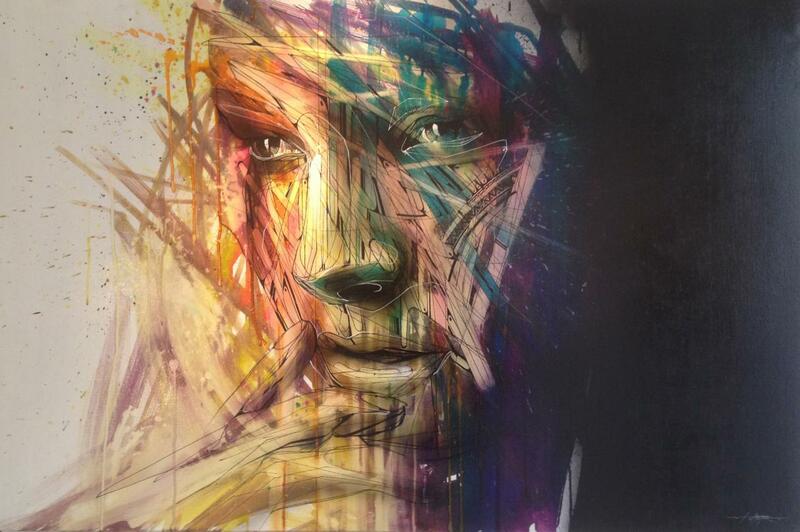 Hopare's creations are all designed out of a perfect geometry, in a graphic abstract style. 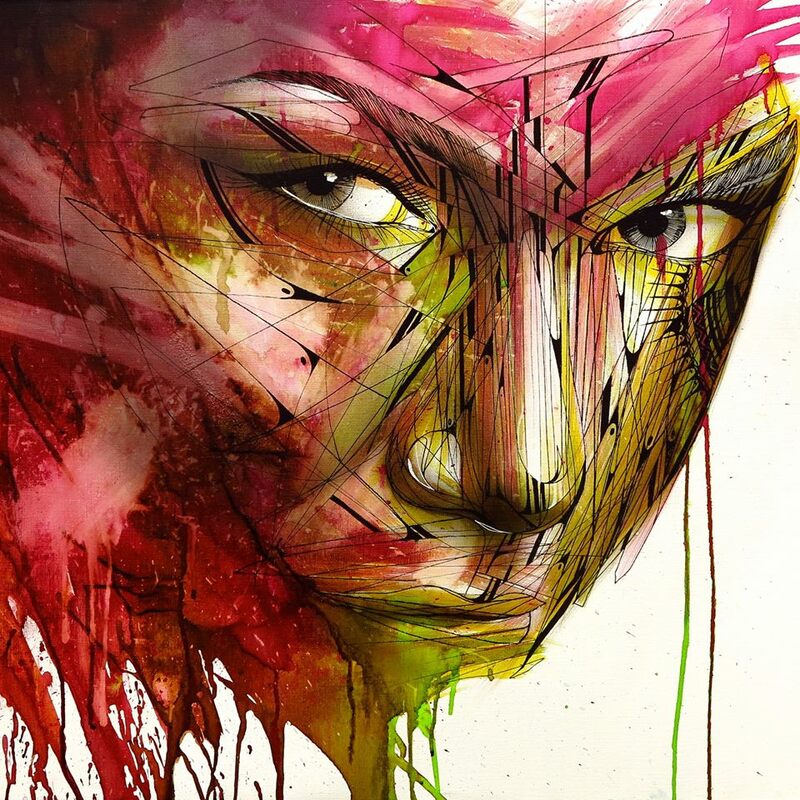 Often featuring faces at the core of his works, the artist utilizes variations of straight lines going from parallel to interlaced ones. 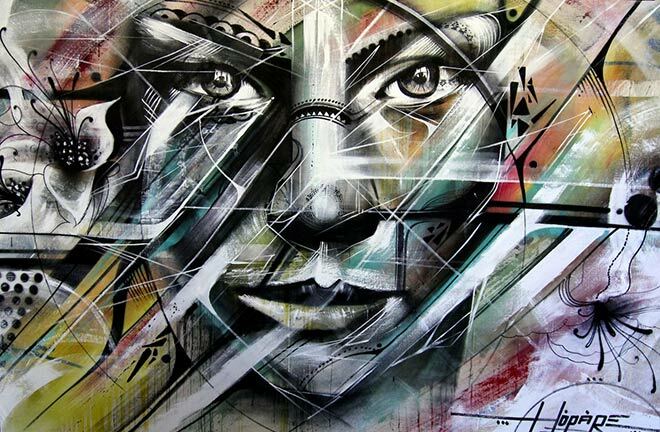 This complex pattern of lines gives nothing but an intense dynamics to his artwork, set up in a pure but strong movement. 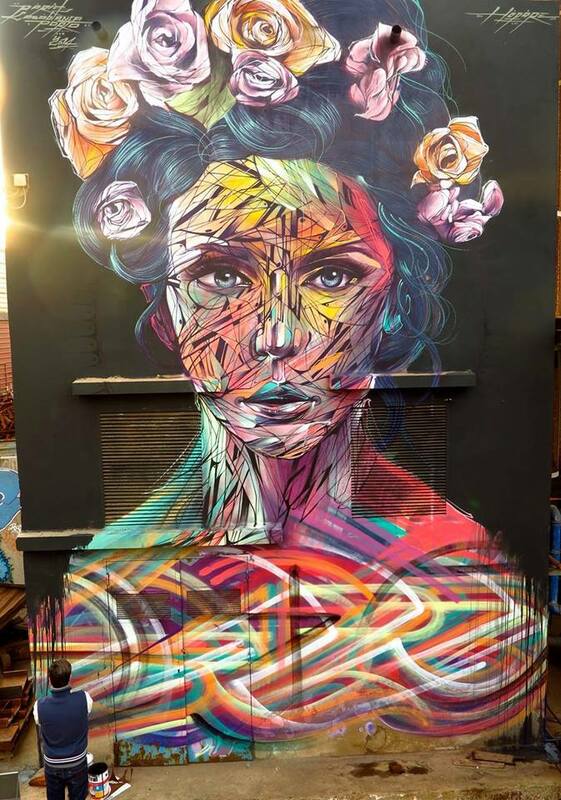 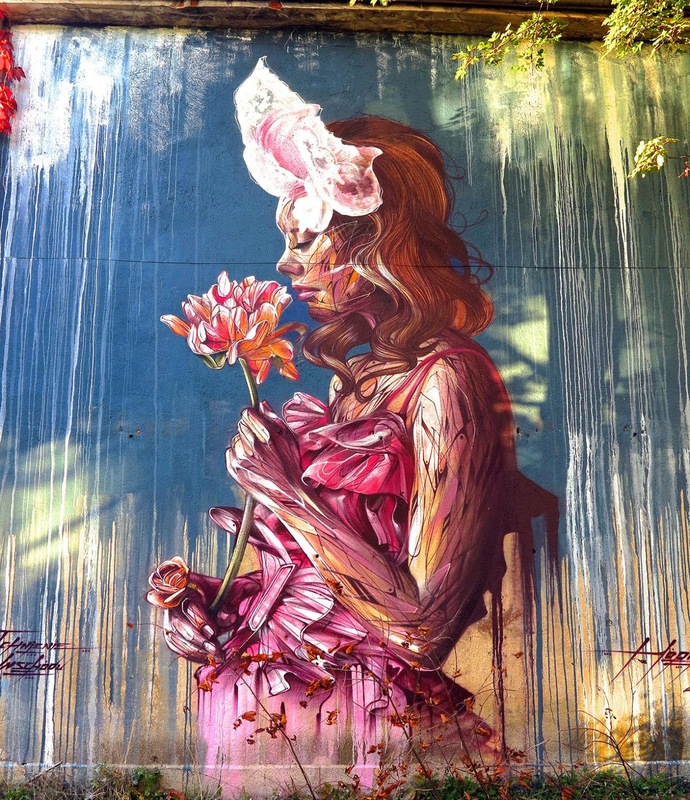 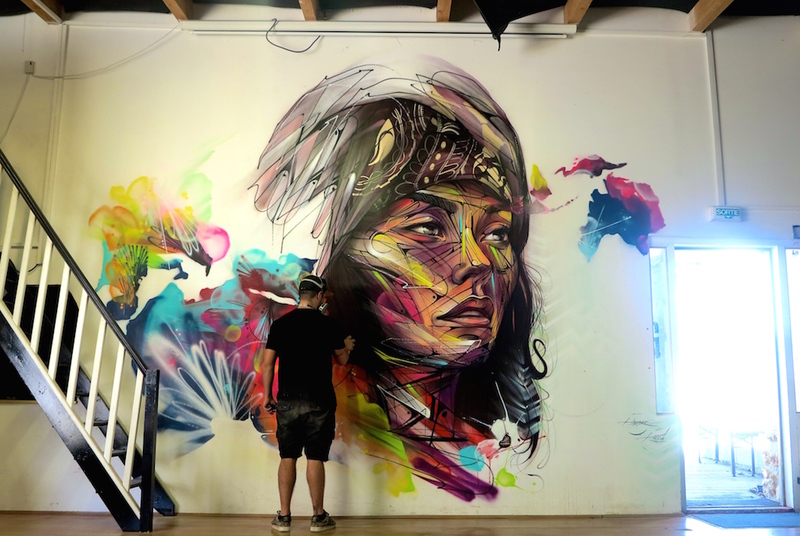 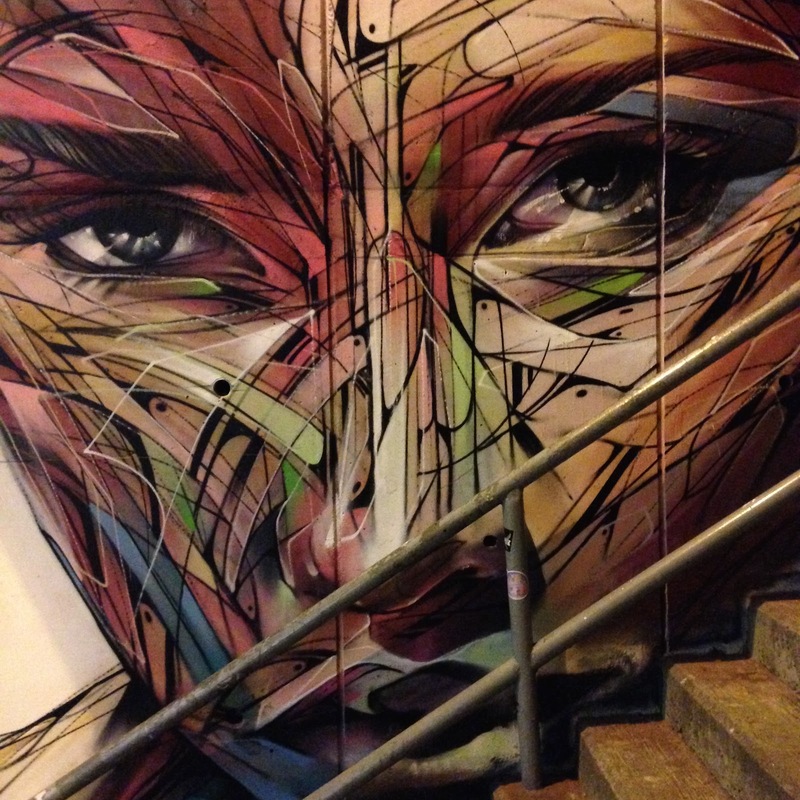 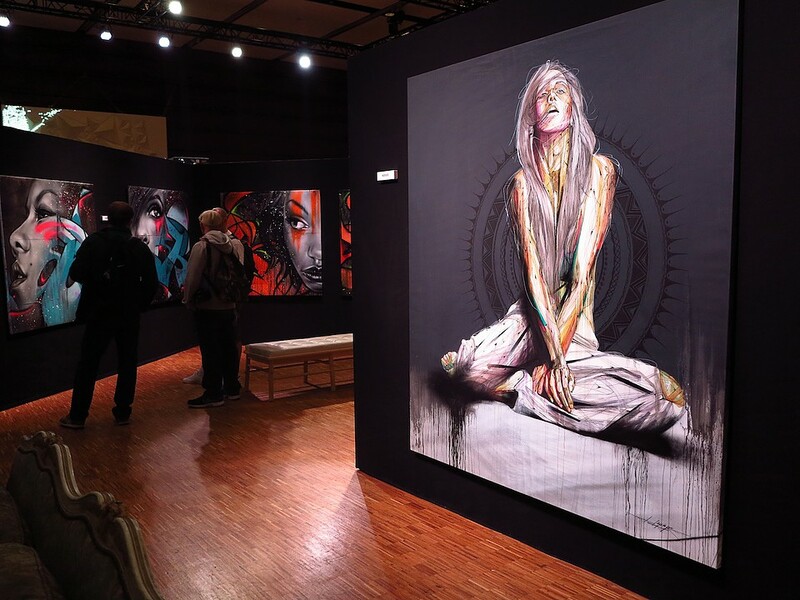 Hopare's inspiration generally comes from his own environment but also his numerous travels. 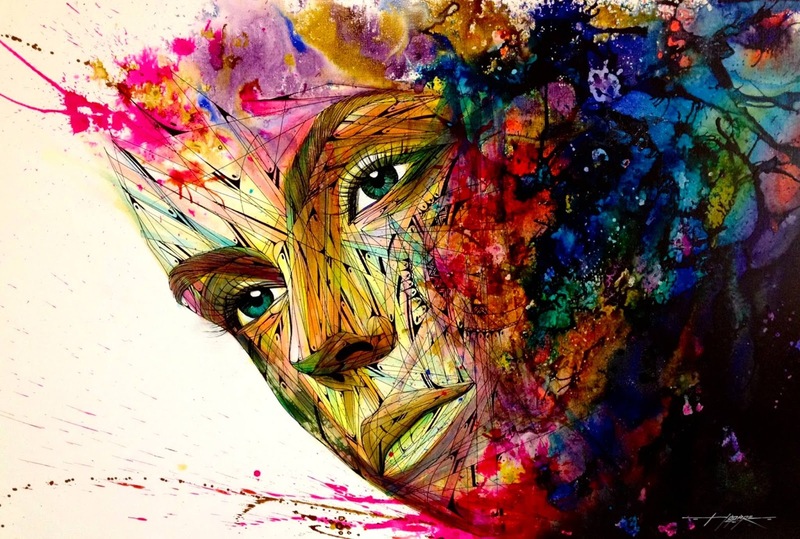 The faces you can see are inspired by meetings, the floral or architectural designs come from striking places the artist visited and the emotions felt are represented with straight lines and a palette of bright colors. 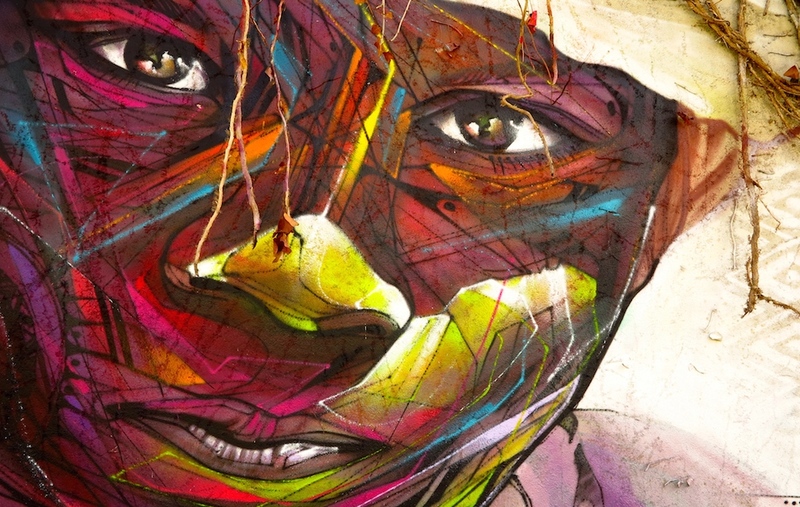 The purpose of his murals are to catch the attention but above all to build a connection with the passersby. 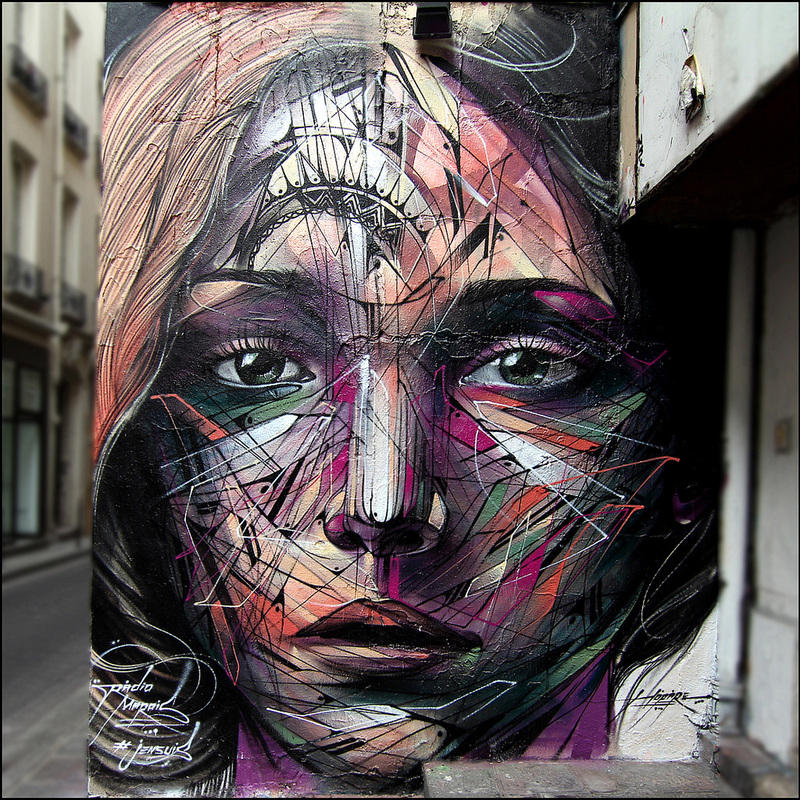 When you see one of his mural, you have no choice but to feel drawn in Hopare's world and be transported. 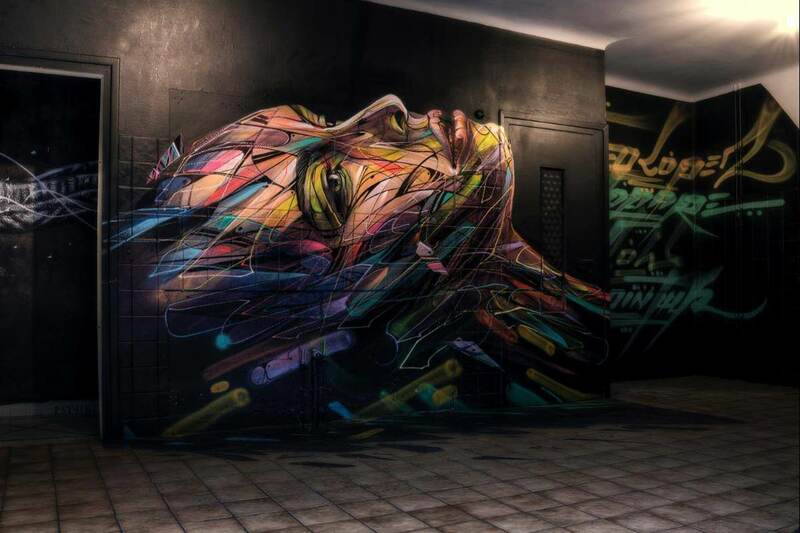 Hopare belongs to this type of artists whose aesthetic experiences are built around human and natural interactions. 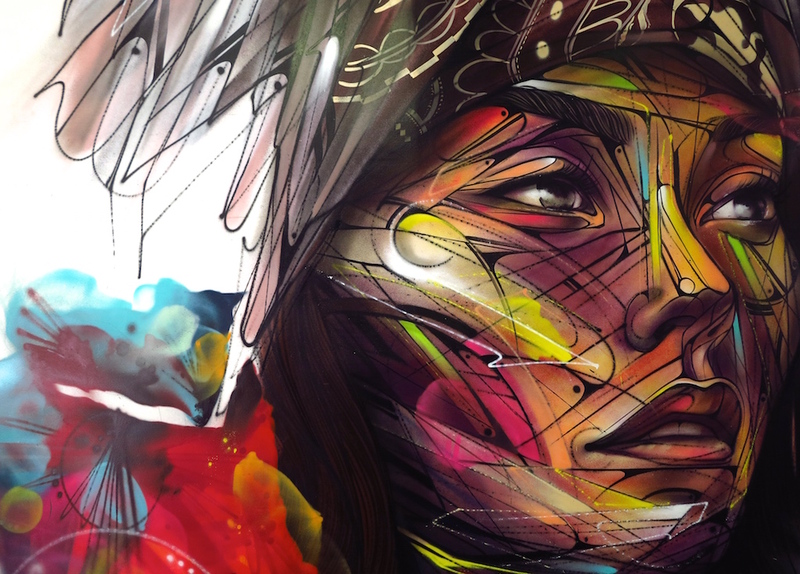 In other words, Hopare is an artist turned to the world. 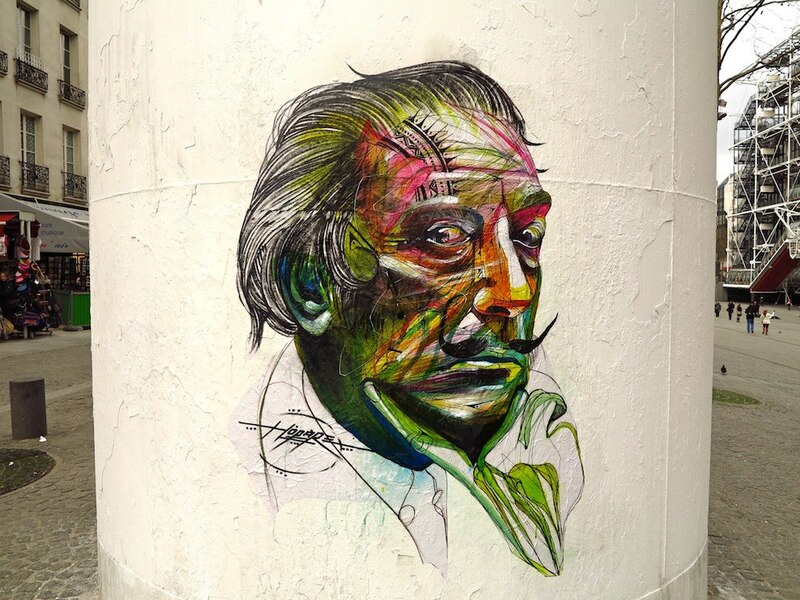 His travels around the globe opened his mind to new cultures and traditions and made his artistic personality even more complex. 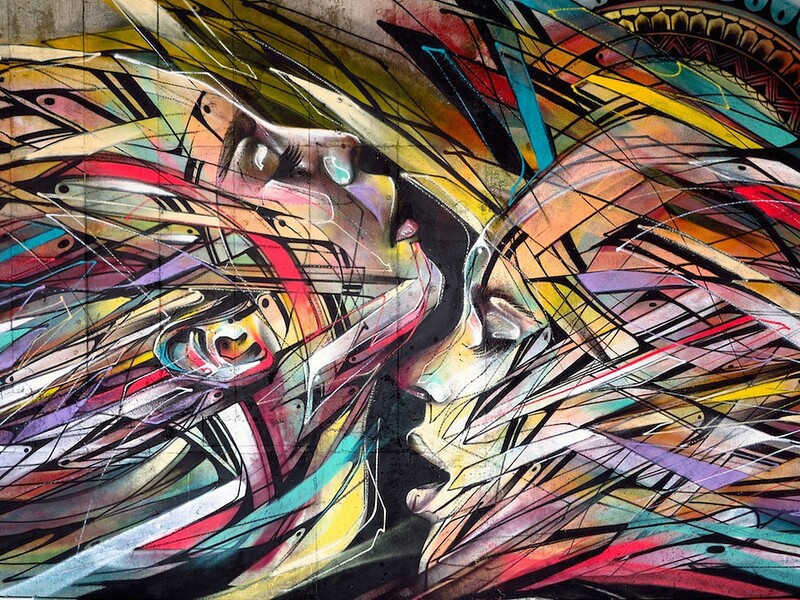 Inseparable from his camera, he never stops seizing the moment to make it everlasting. 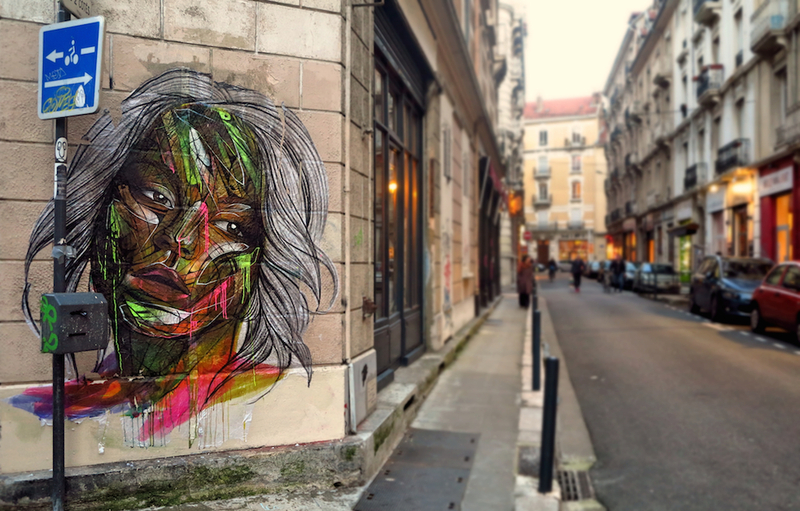 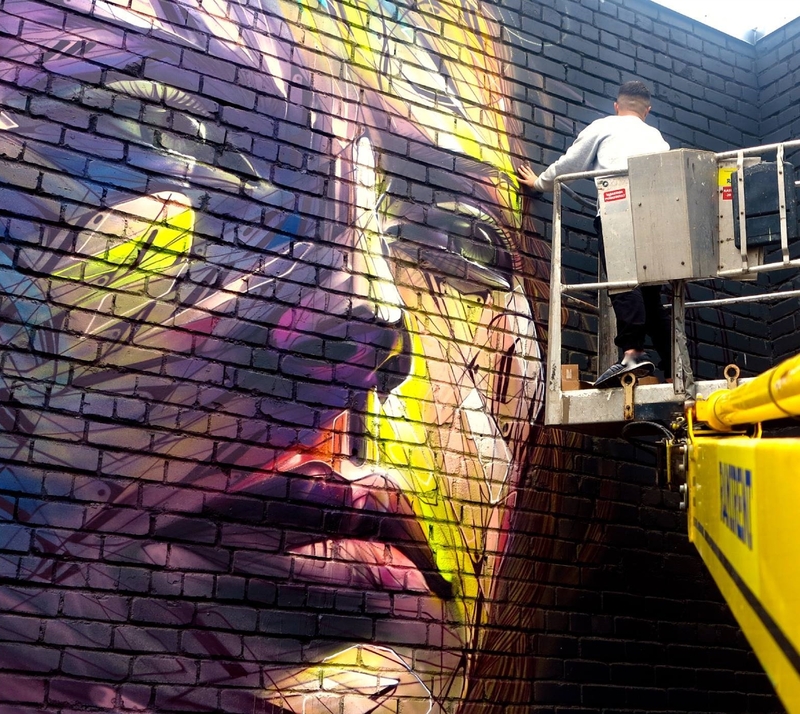 Also Hopare definitely prefers working on the street rather than isolated in his studio. 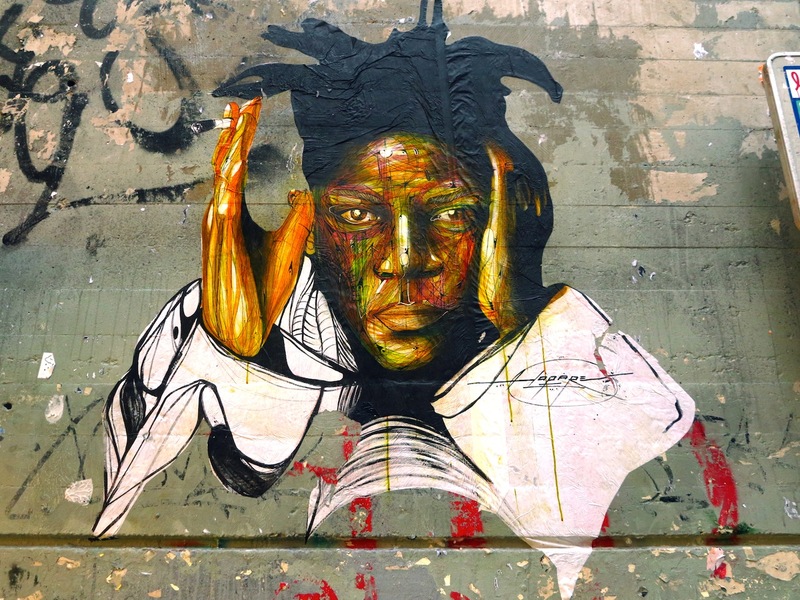 According to him street art - and more specifically freestyle production - is something that makes the artist feel free and a weapon to release the walls from their gray straitjacket. 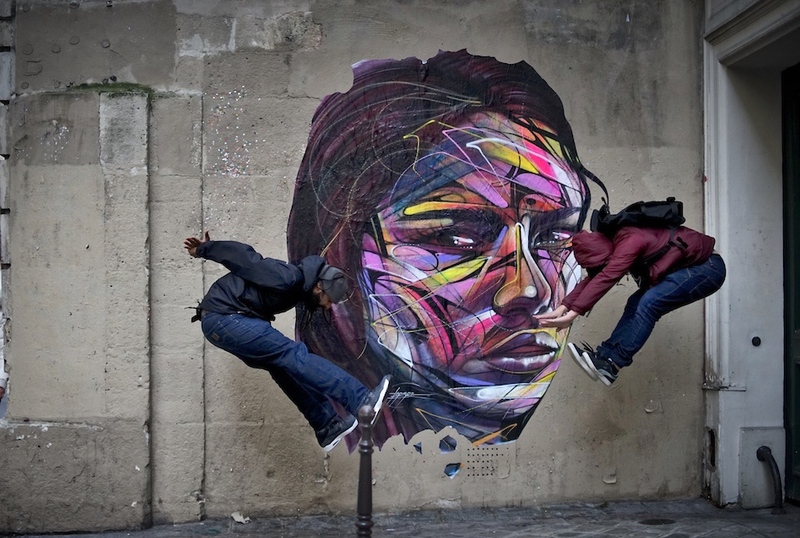 But above all Hopare's street artwork is meant to make the pedestrians virtually travel. 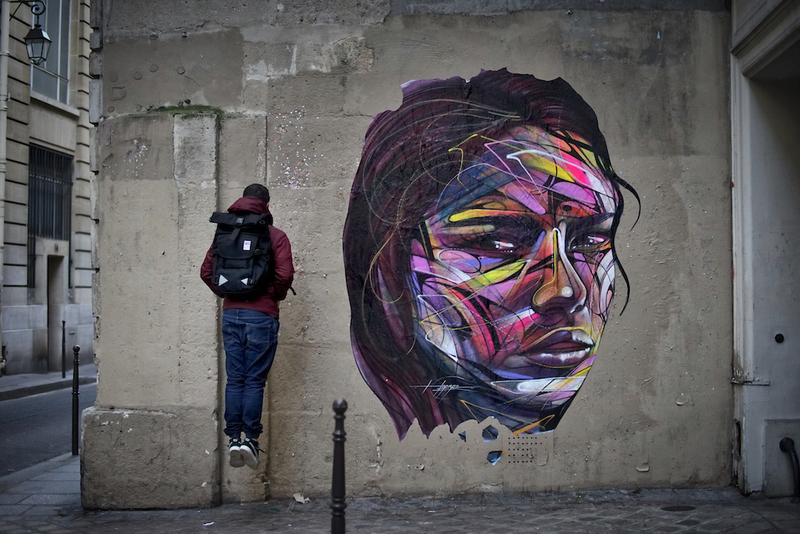 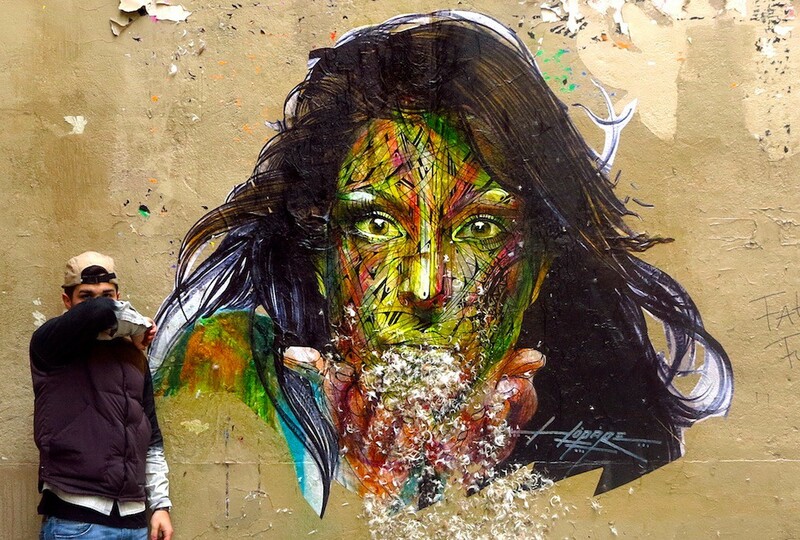 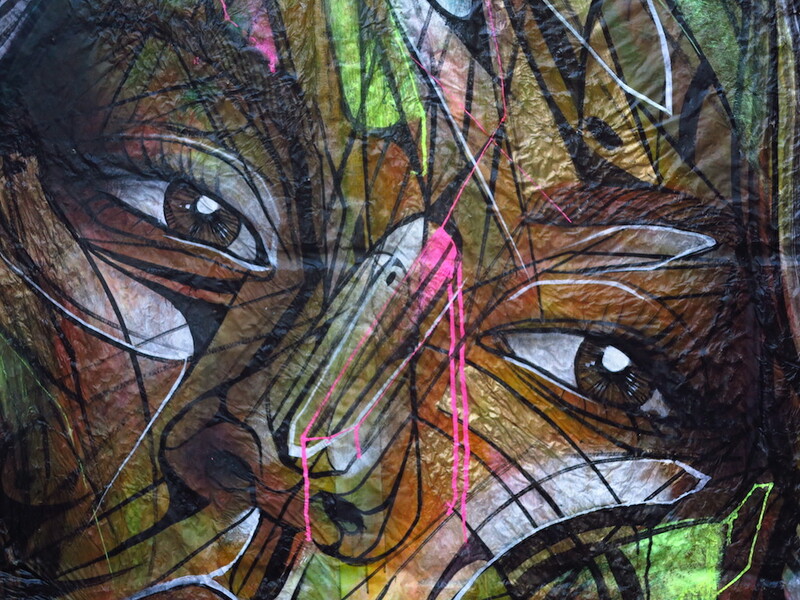 Hopare realized he was meant to do street art quite early in his life. 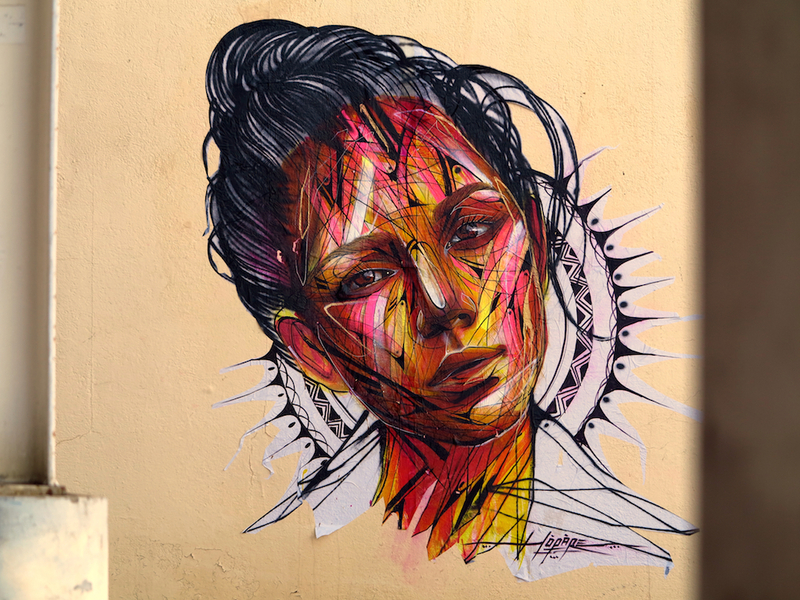 He now skillfully uses different tools like aerosols, brushes, markers, rollers and ink to create powerful murals, collages and canvases. 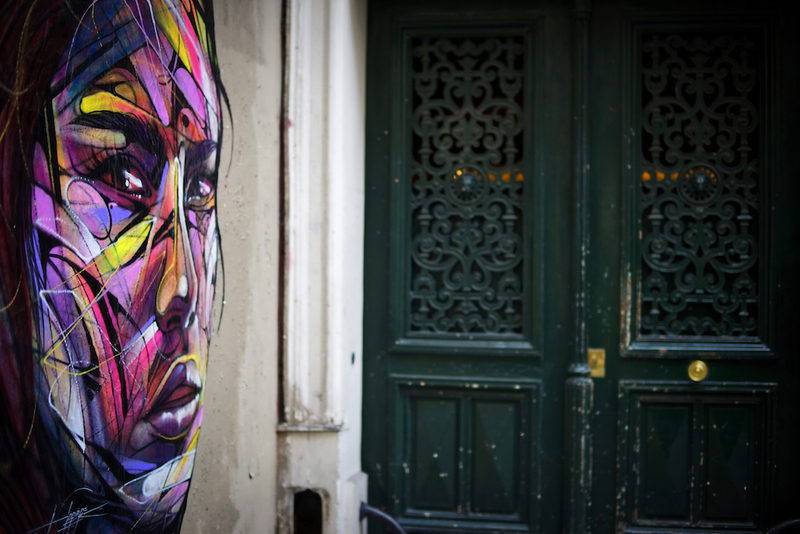 Additionally he participated in the creation of interior decorations and the design of some clothes. 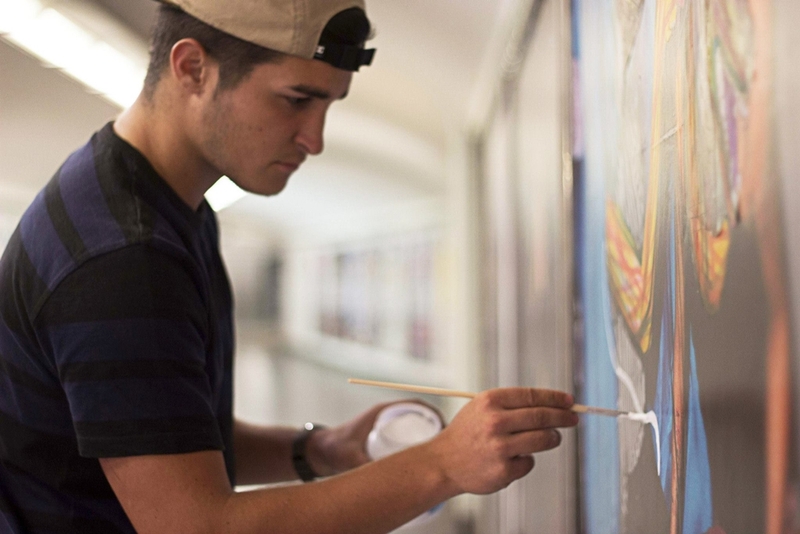 We can't help but admire his multiple talents. 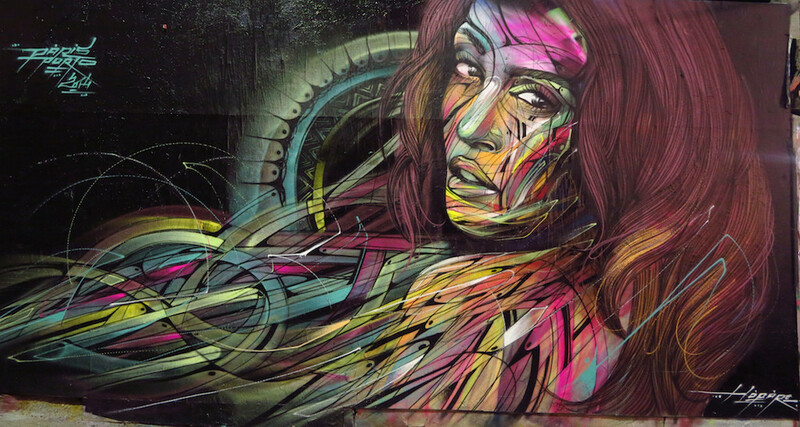 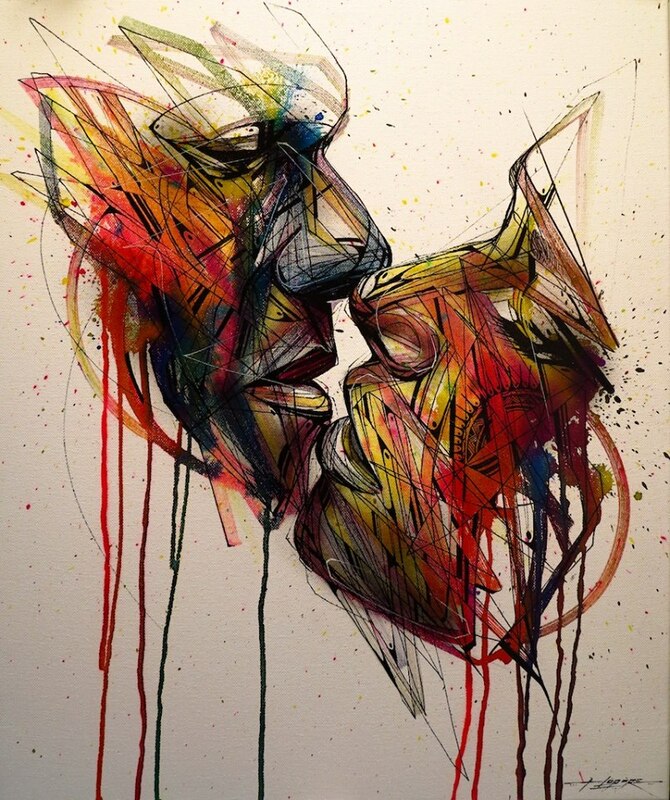 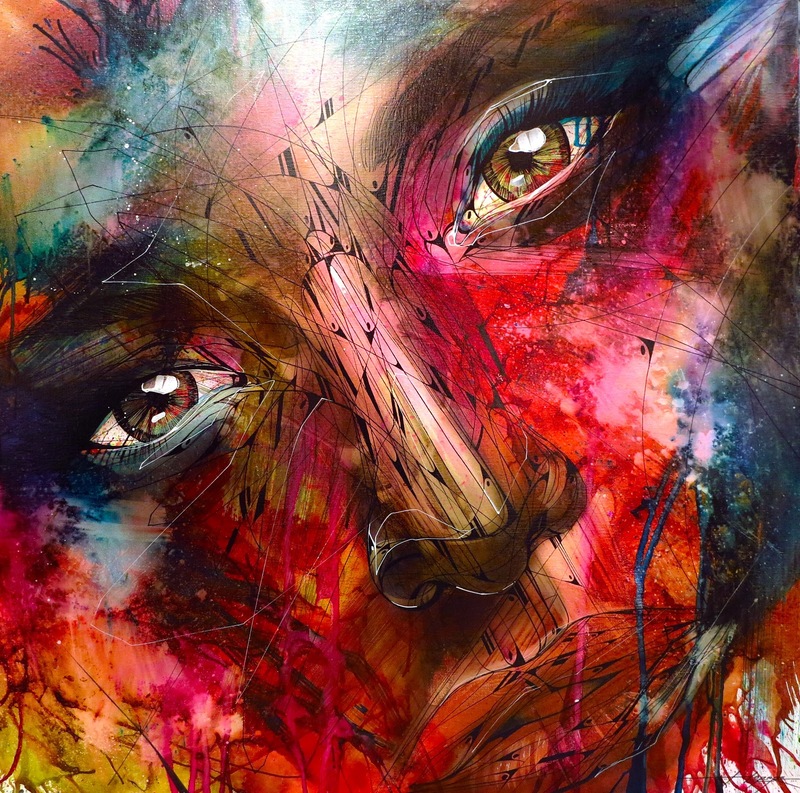 Hopare is obviously a promising artist with an impressive and multi-faceted artistic maturity. 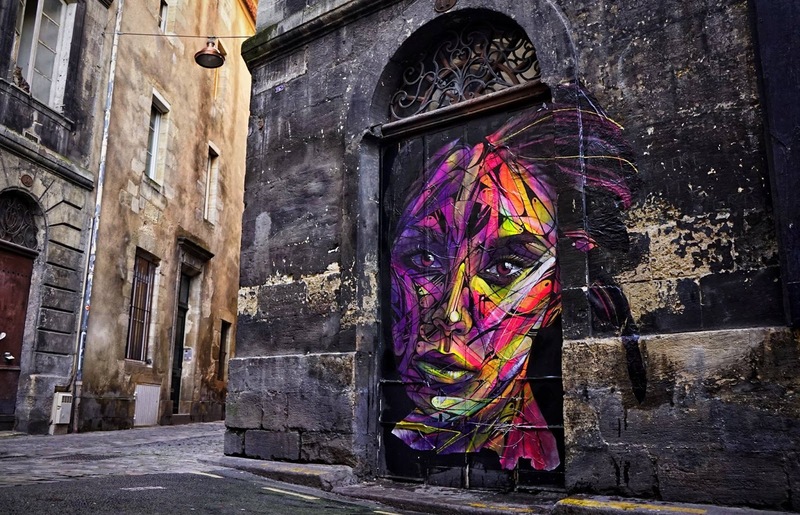 Alexandre Monteiro aka Hopare è un artista di origini franco-portoghesi che lavora soprattutto a Parigi. 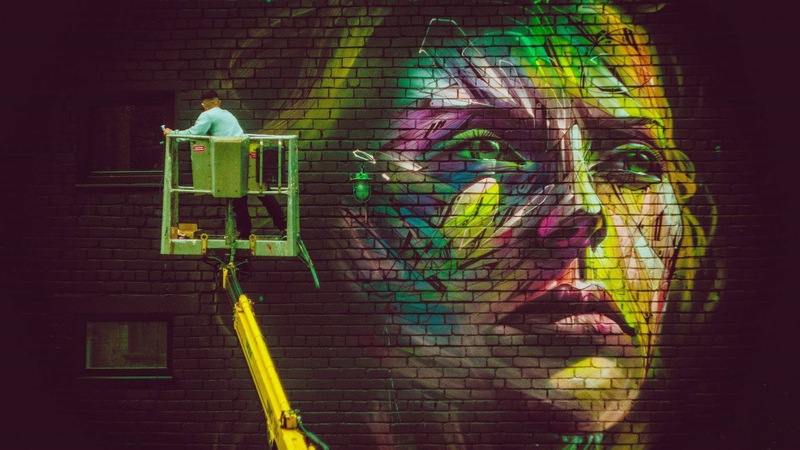 Con un mix tra l'astratto ed il figurativo mette in evidenza un mondo dinamico ed il suo rapporto con la città, grazie all'energia vitale che sembra animare le sue opere. 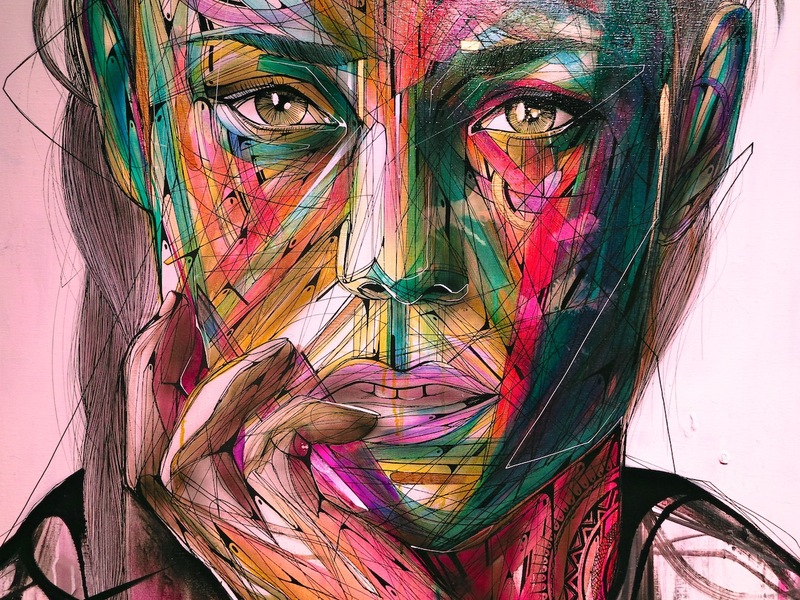 Le creazioni di Hopare sono tutte progettate da una geometria perfetta abbinata ad uno stile grafico astratto. 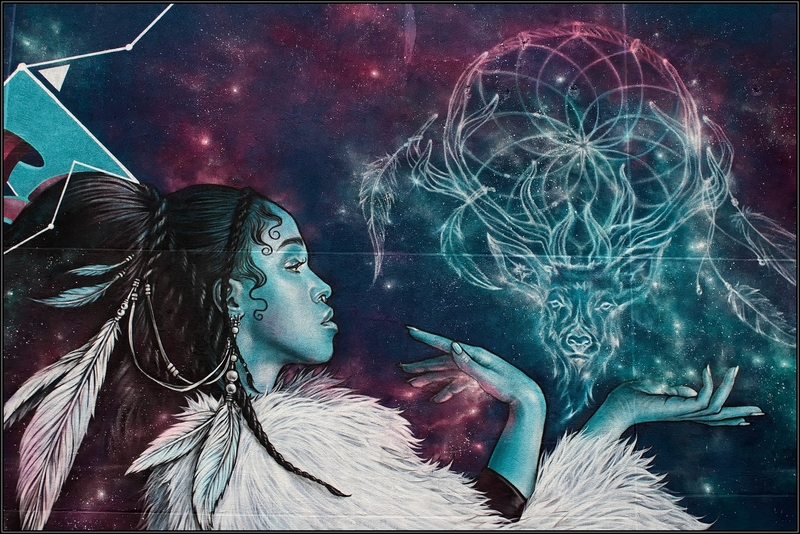 Quando ti trovi davanti un'opera di Hopare non hai scelta, vieni semplicemente trasportato nel suo universo fatto di colori e geometria. 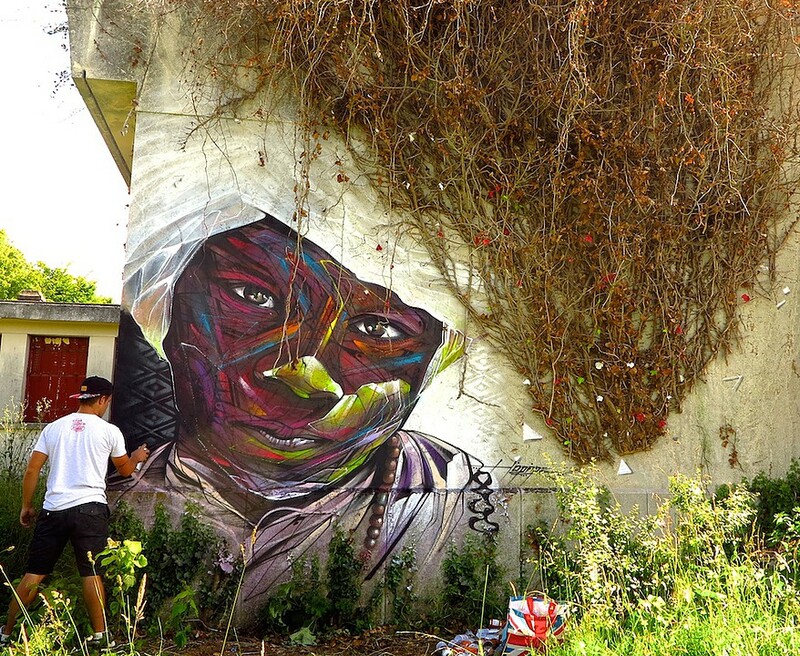 Anche Hopare è un artista che preferisce lavorare in strada piuttosto che isolato nel suo studio ed ammette che la street art, ed in particolare il free style, è un'arma che permette di liberare le mura dallo loro camicia di forza grigia. 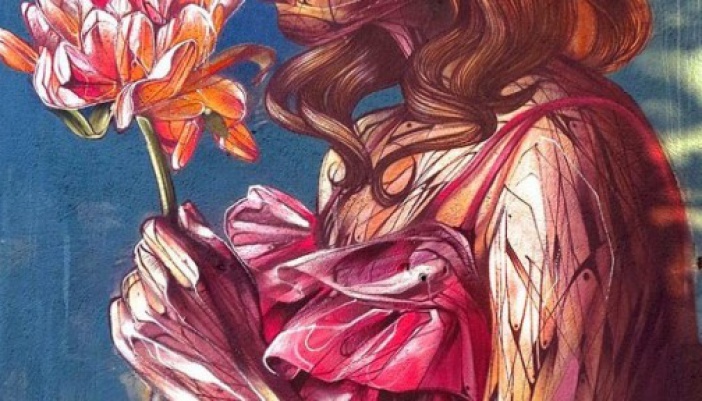 Insomma un artista promettente con un'impressionante e multiforme maturità artistica.